Autoblog interviews Nissan's EV boss, Nicholas Thomas, at the global HQ. Autoblog recently went to Japan to drive cars, ride trains, and talk to carmakers about automotive history and the future of mobility. This video is part of a larger in a series of special reports from Japan. YOKOHAMA, Japan — On our recent trip to Japan, we spent a day driving the new Nissan Leaf through some unfamiliar territory. Despite the challenges of driving in a foreign country on the opposite side of the road, the Leaf proved to be a calm and willing companion thanks to its smooth electric powertrain and ProPilot driver assistance system. Following our drive, we met up with Nissan's EV director, Nicholas Thomas, at the company headquarters to talk a bit about the future of electrification and automated driving, pillars of what the automaker calls "Nissan Intelligent Mobility." You can watch the interview in the video above, or, if you're more of a reader, scroll down to read the Q&A. John Snyder: What are the sort of guiding principles behind Nissan intelligent Mobility? Nicholas Thomas: Nissan Intelligent Mobility is really our strategy for bringing together the three big, big developments in vehicles overall today. Those are what we call Intelligent Power, which is really electrification of powertrains and how do we adapt motor vehicles for the future, Intelligent Drive, which is every level of autonomous drive from simple features like Forward Emergency Braking all the way through to fully robotized taxis, and then the third which is all about connectivity, what we call Intelligent Integration. How does the car fit in with our lifestyles from our smartphones to the things we want to do in the car, to some of the unique things that we can do with an electric vehicle in terms of actually integrating it with your home or your building or your grid power circuits? Can you tell us a little bit about the EasyRide robo-taxis? It's a very exciting time in mobility. As we've talked about, mobility as a service is becoming something that people are starting to understand. In simple terms, that means rather than owning a car, you might want to call up a car as we do with ridesharing today. The next level of that is actually to make those autonomous, and we're very excited to be doing some real-world testing of that. We're very much at the field testing stage, but the technology is advancing really fast. We have fully autonomous taxis driving around in Yokohama now as a test. The popularity of those is far outweighing what we expected, and it's great to be able to actually get real people into these cars, and to understand what they'll want to do in the car while they're there, and how they will interact with the service. Are you finding that people are embracing it or are people nervous about it still? The first time you go in an autonomous car, it's a nervous experience, of course. It's a new experience, but people adapt to it really, really quickly. 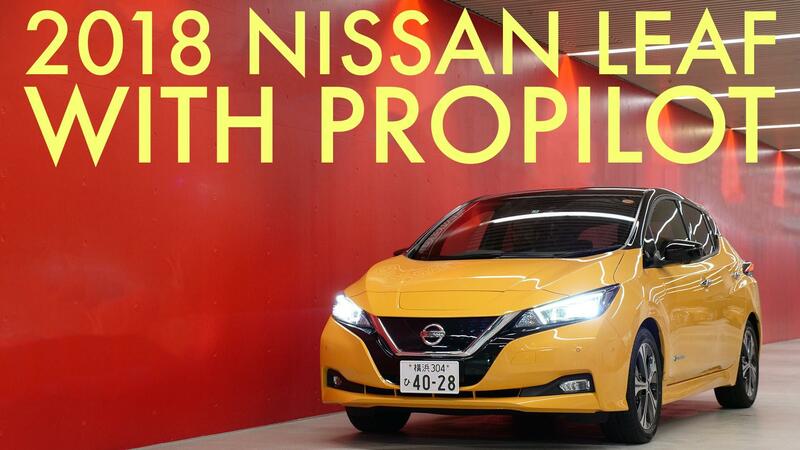 We find that not only with the robo-taxis, but with ProPilot on the new Nissan Leaf. The first time I drove that, I was very nervous about, will the car know when to stop? Will the car know when to steer and anticipate? But we find the system works fantastically well, and it's able to follow both the lines on the road, interact with the other traffic on the road, and it becomes a really intuitive experience that people are really valuing as well. It's not about taking over the drive. When the drive's boring, we'll do the bits for you, and give you that enhanced confidence, enhanced safety when you want to enjoy driving yourself. What comes next after ProPilot Assist and ProPilot Park? Well, today we're able to offer single lane highway driving in a fully automated way. As you say, the customer remains in control, and at times, the car will ask you to take back control. What we're looking to do is in future years to actually bring multi-lane highway driving, and then to take it to beyond those levels. We're testing cars today which will be able to drive through the city. In many cases, the customer won't actually need to interact with the drive. Those are a few years off. Nissan believes very firmly in democratization. We don't want to introduce a $100,000 car that nobody can afford. It's about bringing those technologies to real people in a real, meaningful way. As this technology advances, how do you see that sort of changing how people interact with the car? Is that going to affect design? Is that going to affect user interface? Yeah, sure. If you look at some of the concepts we're showing lately, the IMx concept which we debuted in October last year and we're taking around the world now to show people, it's got a much more open cabin. The combination of an EV powertrain, frees up a lot of space at the front. You don't have an engine in the engine bay, so you get a lot more freedom in the room. Customers will have the option not to drive at certain points. That means we have to provide a much more interactive space, much more freedom. You get a flat floor with EVs, because you don't have a driveshaft going through the cockpit. You've got lots more freedom to move and freedom to be creative with the space. Our designers are having a great time at the minute trying to reimagine what those spaces are. That's one of the interesting things about the robo-taxi, the DeNA test that we're doing in Yokohama right now, is just seeing what people want to do. If they're no longer required to actually be driving all the time, what do they want to be doing in their space? Our Intelligent Integration strategy is about bringing the next level of connectivity and entertainment into the vehicle for those times when you're not driving. We all know what it's like driving with kids in the car. You want them to be engaged and entertained in a meaningful and productive way. The car really can become a space where you can do so many more interesting things than you have to do today. Still, we want to provide a drive that people want to take. When you've got that country road or the highway, the open highway, in front of you, we want absolutely you to enjoy taking control of that. So there's a life yet still for enthusiast vehicles going forward. Do you think there's an opportunity for more people outside of metropolitan areas to embrace both electrification and autonomous vehicles? Yeah, we don't think of electric vehicles as city cars, and neither do our customers. We've got 350,000 customers around the world, the most of any company, and of those, about 70% are actually living outside of major dense urban areas. We've got a very good take-up of electric vehicles in people not living in cities, people who are driving long distances. I was talking to a taxi driver in Europe who's done 300,000 kilometers now in his Nissan Leaf. That's incredible. We've got lots of examples of those long-range customers now and people who are using their vehicles with an EPA range over 150 miles, a real usable range, and then the quick charging network that we have. People are able to do long distances now. Of course, battery technology will continue to evolve. Of course, there will be longer distances. But I really think with the ranges that we're achieving now, range anxiety is going to be a thing of the past very quickly. What sort of technologies or infrastructure needs to be put in place to enable cars to be able to go off on their own and run errands or pick up other drivers while you're at work? A lot of it's about legislation. We need to work with governments to make sure that we have the right legislation in place to manage those vehicles, and to make sure that everybody understands the capabilities, and that everybody's clear on that. From an infrastructure point of view, we're working with lots of really interesting partners, and they're developing all sorts of business ideas that we're working on, where you can take that technology and then apply that in different scenarios.